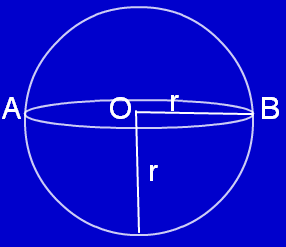 This is a solid generated when a semicircle is being rotated about its diameter. In three-dimensional space, this is also known as perfect round geometrical object. A plane is at the center of the spherical solid divides the solid in to two equal parts. Each shape is called hemisphere. A very good example we can say for spherical shaped solid is globe. Ball is another good example for spherical shaped solid. The size of this kind of solid is depending upon the length of the radius. If the the radius is more the size will be more. If the radius is less the size of the solid would be less. As we have height,slant height in cylinder and cone, here we don't have height or slant height. We have only radius. But we can represent height as radius. That is height is two times radius. Even though we define height of the spherical shaped solid in terms of radius, we don't consider and we don't use height in finding curved surface-area, total surface-area and volume. Since we don't consider height of the cylinder at any circumstances, that is when we find curved surface-area,total surface-area and volumes, very few people are aware of height of spherical shaped solid. Role of radius in finding areas and volumes: Since we don't consider and we don't use height at any circumstance, we use only radius to find everything(curved surface-area,total surface-area and volumes). Radius of spherical shaped solid plays a vital role in finding curved surface-area, total surface-area and volumes.If we find the volume of the shape it will represent the weight of the shape. To know more about areas and volumes of spherical shaped solids, please click the links given below. We hope that the above pages will be very useful.